NAPPANEE — In track and field circles, it’s often the last leg of relays that gets the most attention. But NorthWood’s Landon Parker wants you to know the first leg is pretty important, too. And he ought to know. After all, that’s the senior sprinter’s specialty. “We start him with his ability to get a great start. His start technique is the best that we have on the team,” said NorthWood boys track coach Mark BeMiller of Parker. “You know you’re going to get a quality start every time. You’re going to get track position. While Parker may give the Panthers’ decorated relays a boost, he’s pretty good on his own, too. In a program known for having a deep and strong corps of sprinters, Parker has emerged as likely the team’s best this year. His strongest performances at the start of his senior season have been in the 200, but his versatility allows BeMiller to slot him in any race from the 400 on down. And he’s done so in the face of some adversity. Parker, who also plays soccer for NorthWood, has had not one but two shoulder surgeries to repair a dislocation he sustained during indoor practice his freshman spring season. The first surgery following that injury wasn’t a total success, and he went under the knife once more last summer in hopes of getting ready for his final year of Panther athletics. So far, so good, says Parker, who has already recorded his best-ever 200-meter times this spring, and he, Taylor Knight, Brock Lehman and Bronson Yoder have a berth at the Hoosier State Relays indoor state finals in Bloomington Saturday, where they’re seeded 15th in the 4×200 with a 1:33.8 stop. “Right now I’m feeling really good about my shoulder. I got my second surgery after it came out again. I was actually jumping on a trampoline, and it popped out, so I had to get surgery a second time. But hopefully after the second one I’m all healed and 100 percent,” said Parker. In addition to his injuries, Parker has had some setbacks on the track, too. Both he and Yoder are holdovers from last season’s Goshen Sectional-champion 4×100 team. Alongside 2018 grads Terrell Pratcher and Brayton Yoder, that foursome set a new sectional record with a blistering time of 42.28, a mark that placed them among the state’s elite, and they were expected to roll through the regional round of the tournament the following week. Roll they did, but the final handoff between Pratcher and Bronson was ruled late, and both the relay’s Warsaw Regional championship and a berth at the IHSAA state finals the following week were taken away. That experience left a bitter taste in Parker’s mouth, but it also ignited a fire in him to work even harder. Parker completes his handoff to Terrell Pratcher during last year’s Warsaw Regional 400-meter relay race. “Everyone says you learn best from your failures, and it was probably one of the hardest days of my life, really, because we were top five in the state and getting DQ’d in the regional is a tough day. But really I just kind of looked at it as, well, bad things happen, and I’ve just got to move on and work harder,” he said. 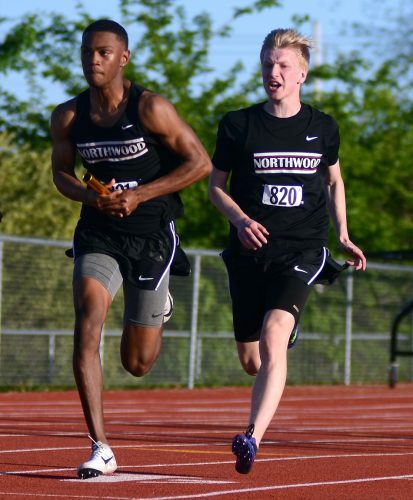 While Parker, Yoder, Knight and Lehman carry on NorthWood’s tradition of great sprinters, this year’s Panthers have a lot more going for them. The team’s distance crew looks pretty solid, with Tyler Evers, Sam Schlatter and Carson Martin leading the way. 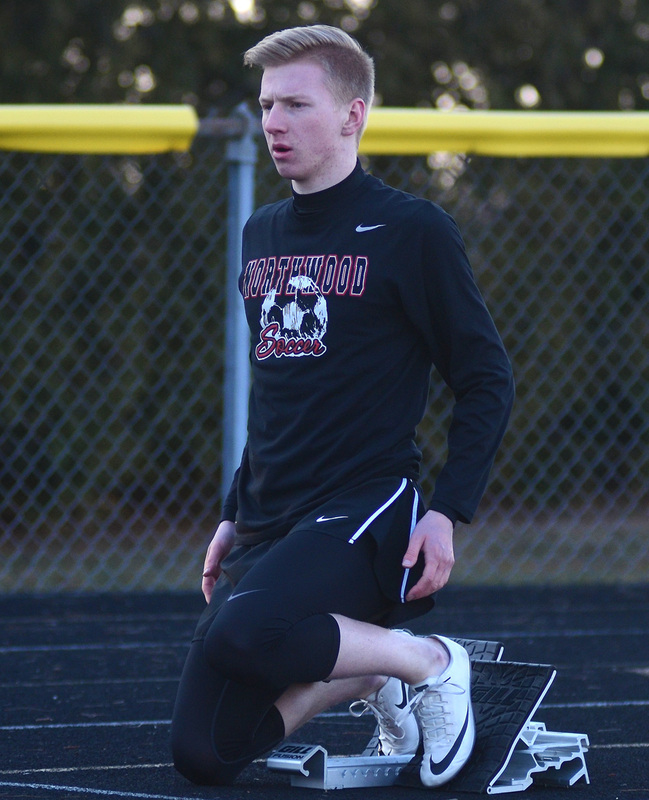 Yoder should also provide his team some serious points in the field as one of the state’s best long jumpers, and he owns a second appointment at Saturday’s HSR meet in that event with a sixth-seeded, 22’1.75” distance. Garrett Anglemyer is emerging as an elite thrower, meanwhile, and the Panthers have added a host of young talent to the team this year, too. “Our practices are a really good environment. It’s a fun environment, but it’s a competitive environment. It makes it easy to coach,” said BeMiller. Along with all those talented athletes, BeMiller also shouted out senior managers Ally Steensma and Ireland Hooley, a duo that he says makes his job much easier, too. “I carry around a piece of paper, they get down all the splits for everybody. I’ve been coaching for 30 years and never had managers do that before. They know the sport. They know the team. They know me really well. They could be my daughters, and I am blessed to have them,” said BeMiller.